The Festival of Remembrance at St Andrew’s Church, Aysgarth, in November 2018 provided an opportunity for Hugh Rose of Leyburn and Catrina Cloughton of Thornton Rust to remember their father: Major Donald Herbert Rose MC (above). Major Rose was born in 1885 in Lincolnshire, went to what was then Ceylon in 1910 and became a tea and rubber planter. He joined the Ceylon Planters Rifle Corps (CPRC) in 1911. 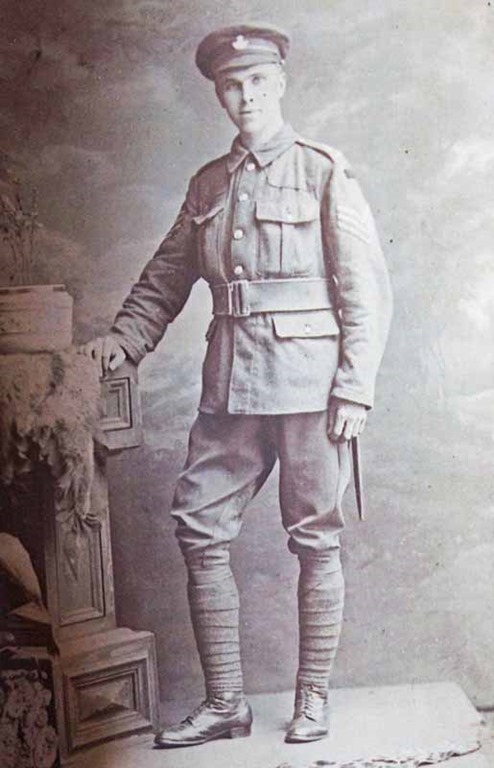 Lance Corporal (Rifleman) Rose was among the 237 from the Corps who were sent to Egypt in October 1914. They initially helped to defend the Suez Canal against Ottoman Turkish attack. In December that year they joined the Wellington Battalion of the newly formed Australian and New Zealand Army Corps (Anzac). They made such a good impression that many were sent for officer training. Rose did his in Egypt with the 1/6 Essex Regiment. In August 1915 the regiment was sent to Suvla Bay, Gallipoli. Those who survived were evacuated in December 1915, first to guard the Suez Canal and then to fight the Turkish Army through Egypt into Gaza. Major Rose commanded the company which was the first to enter Gaza City. From there they went to Damascus where he and his company marched into the city 200 yards behind General Allenby and Lawrence of Arabia. He finished in Baghdad and returned to Ceylon in 1919. He remained there until the early 1950s by which time he was married. On returning to England they finally settled in Thornton Rust when his wife Joan became the assistant matron at what was then a sanatorium at Thornton Lodge. He died in 1963. 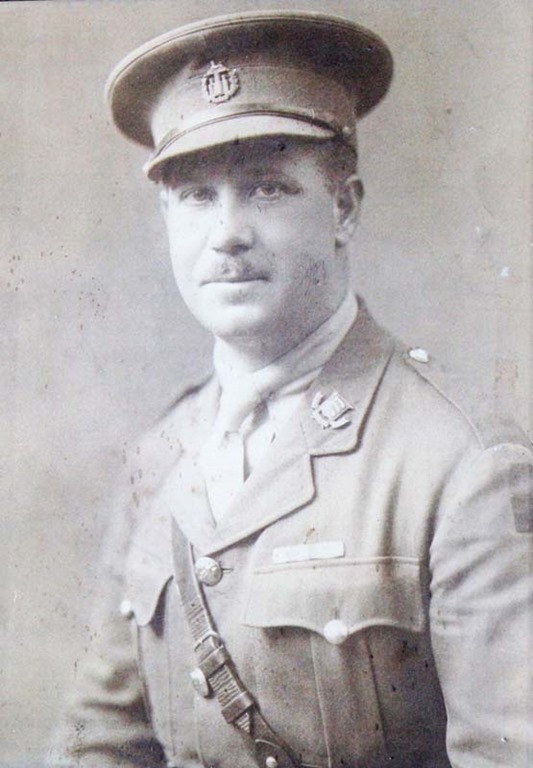 “Trina” Cloughton also shared the sad love story of her maternal great uncle Sgt Ernest Moore. He grew up in Tudhoe Colliery in Co Durham, the only son of John and Alice Moore. John was from a mining family but attended evening classes after he left school when he was 14. He worked his way up to becoming a mine’s inspector. His job included making sure there was no gas in the mines said Trina. When Ernest joined the Durham Pals (18th Battalion Durham Light Infantry) at Craken Hall on 29 December 1914 he was 20 years and 10 months old and listed his occupation as “shop assistant”. 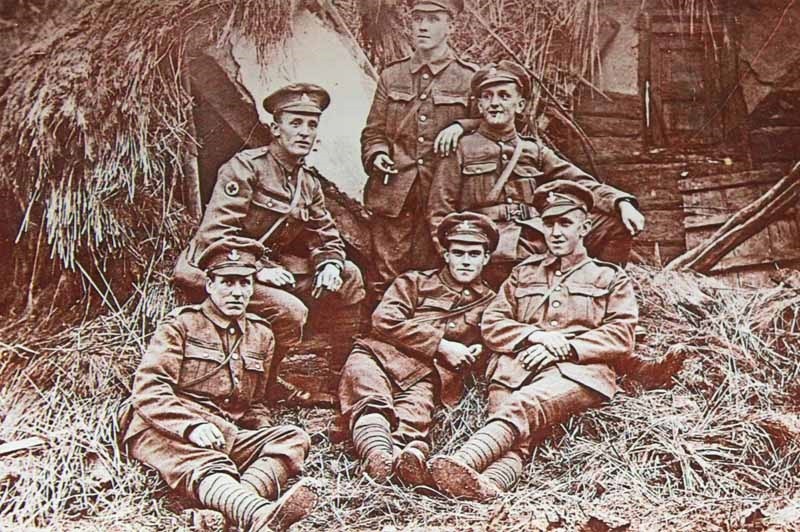 After training the Durham Pals were sent to Egypt late in 1915 to defend the Suez Canal. They were then moved to France in March 1916 for the “Big Push”. Sgt Moore survived the Battle of the Somme but was killed in action on 19 May 1918. He was buried at Caestre Military Cemetery in France. He had hoped to return and marry his girlfriend and had given her a bracelet as an “engagement” present before he went overseas. Their bread of life, alas! no more their own…. Below: It is likely that Sgt Moore is the man with a cigarette standing at the back with his arm resting on a friend’s back. He does look older and battle weary compared to that above which was probably taken before he left England for the Western Front.